You are here: Home / Food / March Madness and Sabra Hummus Final Four + Giveaway! Spring is officially here. Winter has come to a close and if you’re a basketball fanatic, hoop dreamer or a die-hard dunker you’ve eagerly awaited one of the best tournaments in college sports. Yes, you guessed it, March Madness is right around the corner and Sabra wants to help you up your snack game! Dara and Gabs love to watch the game, while Mimi and I enjoy making all the delicious snacks and goodies that go hand in hand with watching sports. The NCAA began the March Madness tournament in 1939. UCLA is the winner of the most National Titles in the history of the NCAA. In 2008, all four of the first ranked teams made it to the final four, the only time this has happened in tournament history. If you followed all of the craziness at the All Star game in Toronto, Canucks definitely have basketball on the brain as they gear up to check out some of the greatest moments in March Madness history. While they are amping up to watch the guys on the court, I’m turning to Sabra to ignite my kitchen creativity with some slam-dunk ideas that are sure to make our tournament party snacks legendary. In spirit of March Madness and college basketball, Sabra has come up with one-of-a-kind, “Final Four” hummus options that are a must-try this season. For party meal options that no one will want to take a pass on, select a finalist below and get inspiring snack ideas for each of these delectable dips! Which recipe will beat the buzzer to become the tournament favourite? Sabra Hummus “Final Four” Recipes! For us, the Mediterranean Burgers are the winner. While all of these recipes are sure to be a hit, there’s nothing more classic than burgers while you’re watching the game, right? The caramelized onion hummus is one of my faves and it gives the burgers a creamy and traditional taste with the onions. But, to be honest, I showed Dara all of these recipes and he gave the thumbs-up to all of them. I have to say, I agree and have a feeling that I will be making them all at one point. One lucky Whispered Inspirations reader will win a Dribble. Dunk. 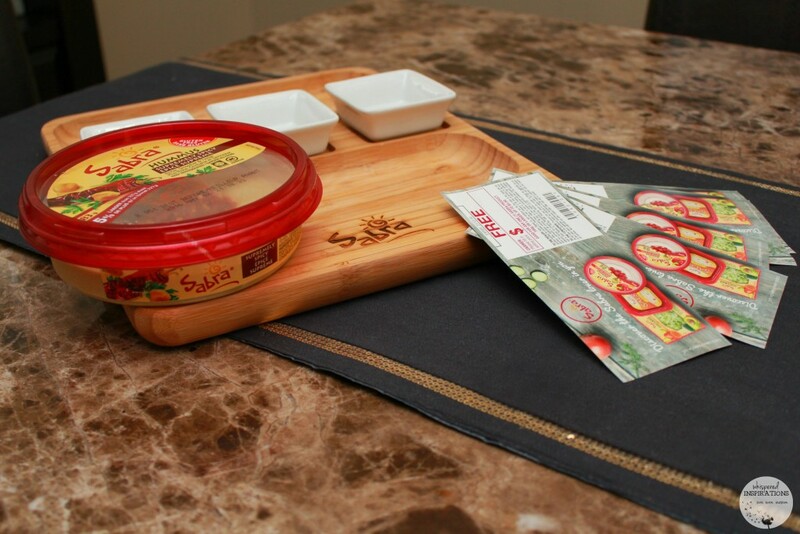 Dip Sabra prize pack! Worth $50. That way, you can set up your favorite Sabra dips and set them out for March Madness and beyond. This contest opens on March 23rd, 2016 and closes on April 6th, 2016. The prize pack contains a serving platter and 5 FPC’s! Make sure you visit www.sabradips.ca to get more information, amazing recipes and more! You can always connect with them on Facebook, Twitter and Instagram! Which Sabra dish would you serve while watching sports? Wow they have so many great recipes but i really loved the ingredients for the Hummus with Sautéed Mushrooms so i would love to try this one. I am intrigued by their Chocolate Hummus Truffles. The roasted pine nut recipe sounds delish! Would also like to try the Chicken Salad recipe. I would love to try this recipe: . I want to try the Black Bean & Goat Cheese Tacos recipe, sounds delish! Thanks for the chance to win! The grilled Hummus Wraps would be my first choice. today would like to try the roasted red pepper ravioli! The salad dressing recipe looks interesting. It never occurred to me to use hummus as an ingredient in dressing. The ravioli and red pepper coulis sounds delicious. I would like to try the roasted pine nut recipe. I'd try the Chicken Salad. I would like to try the Tortilla soup. I would like to try the Sabra Roasted Eggplant. I’d love to try the breakfast nachos. The international auto show video shows just how big of an event it is. Would like to try the roasted pine nut chicken skewer! I would like to try the Breakfast nachos! The breakfast nachos look delicious! Hummus wrap and basil pesto wouy be great to try. I'd like to try the Caramelized Onion. I would like to try the Hummus Mashed potato. I'm always looking for ways to make lighter recipes. Their Chicken Over Asparagus recipe looks so good! I would try the Breakfast Nachos. They look and sound delicious! Stuffed Chicken Breast looks good, would like to try it! I would love to try the Shrimp Bake. Puff Pancake with Guacamole sounds like a dish i would love to try ! I would like to try the Mediterranean Burgers. I'd love to try the tortilla soup. Chicken Skewer sounds delicious. My family would enjoy it. I want to try the basil pesto recipe. I would love to try the Chicken Over Asparagus recipe. The Grilled Veggie Hummus Wrap looks yummy, I love grilled veggies. The Smoked Turkey Sandwich sure looks delicious i would love to try it ! The Chicken Skewer Recipe you shared looks YUMMY!! I'd like to try the Baked Eggs recipe. Breakfast Nachos. The most important meal of the day and this hits the spot. The Sabra Classic or Roasted Pine Nut Hummus as a Salad dressing is a great idea I'd like to try! Id like to try the hummus mashed potatoes! Hummus Deviled Eggs sound like they would be worth trying too. The Ravioli & Red Pepper Coulis looks and sounds yummy! I would make the Breakfast Nachos. I would love to try the Tortilla Soup recipe, sounds great! The chicken skewer sounds great! Hummus Garlic Bread sounds worth trying too. Today I would like to make the Baked Eggs. I would try those burgers – sound yummy! I am excited to try the Grilled Summer Vegetable Pita Pizza. It sounds very delicious with the Sabra Classic Hummus. Mmmm….the Tortilla Soup looks tasty! I'd love to make the Breakfast nachos! Hummus with Sautéed Mushrooms looks like such a yummy dish i would love to try it ! The Tortilla Soup looks great! I'd like to try the breakfast nachos – it'd be a good start to the day! I would love to try the breakfast nacho's. They look really delicious for my family. I want to try the Tortilla Soup recipe. Would love to try the Chicken Salad, it looks really good. Tortilla Soup,it sure looks yummy ! The grilled veggie hummus wrap looks tasty! I would love to try the Smoked Turkey Sandwich, it sounds really yummy! I really want to make the Breakfast Nachos. Lettuce Wraps is another one I would like to try! today i would love the burger! I would like to try the Tortilla Soup recipe. Would love to try the stuffed chicken breast recipe. The salad dressing recipe looks interesting to try. wow the Puff Pancake with Guacamole sure looks delicious i would love to try this sometime! The grilled veggie hummus wrap! I would like to try the puff pancake with guacamole. We HAVE to try the stuffed chicken breast recipe! I would never have thought to try that on my own! It sounds delicious though. I would like to try the Breakfast Nachos. Roasted Red Pepper would be my #1 choice! Would like to try the chicken skewers. The Baked Egg dish looks interesting to try. I'd like to try the Shrimp Bake and Breakfast Nachos. I want to try the Grilled Veggie Hummus Wrap. The chicken salad sounds awesome. The Mediterranean Burger is my choice too! I have all the ingredients so we are trying the Lettuce Wraps for dinner tonight. I would like to try the basil pesto shrimp bake. The grilled hummus wraps sound yummy! I'd love to try the Chicken Skewer recipe made with Sabra's Roasted Pine Nut Hummus. i would love to try the chicken salad recipe. yum! I would like to try the grilled hummus veggie wrap. The baked eggs look very tasty. I'd like to make the stuffed chicken breast. I'd love to try the breakfast nacho. i want to make and eat the breakfast nachos they sound really good to me. I'd like to make the salad dressing! Chocolate Hummus Truffles look so good!! I would try the breakfast nachos. Cucumber Cups is a recipe i sure would love to try ! The Breakfast Nachos still look pretty good to me! Really would like to try the recipe for the Salad dressing. i would like to try their Mediterranean Burgers. I love them all but either the breakfast nachos or this one . I would like to try the Smoked Turkey Sandwich recipe. I really like the idea of the Breakfast Nachos. Would love to try the Baked Eggs recipe – sounds yummy!! The chicken skewers I am definitely going to try. I would be excited to try the Puff Pancake with Guacamole! has made these looks so delicious. Grilled Veggie Hummus for Lunch would be my pick. I want to try the hummus with warm chickpeas. We would like to try the Hummus Mashed Potatoes recipe ! Oh, one of the first recipes I'll be trying is the Breakfast Nachos. I'd like to try making the Mediterranean Burgers. Breakfast nachos look good to me.